It felt like a disaster, and in conventional respects probably was. In summer 2015 I had moved into a new home at the side of the Calder River in West Yorkshire. 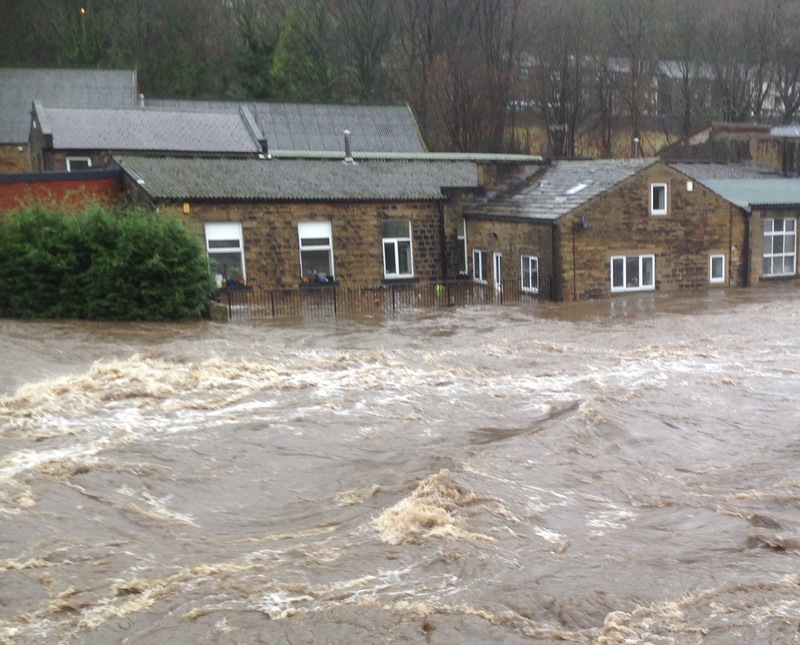 That Boxing Day the record-breaking floods that ravaged Hebden Bridge and other towns along the river left the house in ruins and me suddenly homeless and literally wondering where to go. 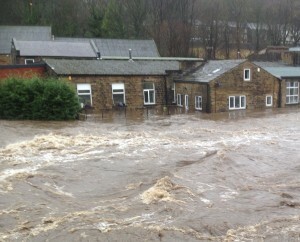 Flooding like that brings obvious misery and trauma. This was clear to me as I waded out of my no-longer home through waist-high near-freezing water, carefully keeping my footing lest I be swept away or lose hold of the survival bag I carried over my shoulder. I felt it as I wandered the streets of Halifax later that day, dazed and confused as Boxing Day closures left me without access to food or transport. I felt it when I later returned to what in the space of a few hours turned from a cosy, welcoming nest into a mess of mud-clad debris of possessions and household effects. This life-shattering experience deepened my sympathy with climate migrants and other people forcibly displaced by war, enclosure and appropriation of land world over, lacking or having taken from them the safety nets which we in relatively rich societies can, for now, still have available. In contrast, the aftermath of the floods became a deeply nourishing experience in being held in the support of my new community. Offers of immediate refuge and longer-term accommodation, many from previous strangers, have kept me comfortably, if transiently, housed. A wider mobilisation provided food, cleaning supplies and help with all aspects of the clean-up, and in my case relocation. Town halls became temporary support centres, cafés became soup kitchens, neighbours not directly affected offered help whenever it was needed and further support arrived from all over the country. Partly by taking this support as an opportunity to relax my attitude of compulsive self-reliance, I have been able to open to deeper lessons about trust, acceptance and their relationship to personal resilience. While living by the river, the heart of what is still a truly magical valley, I had come to know it as a great teacher. The lesson it brought to me when it swept through my home and washed away my previous life was this: to let go of the illusion of control, surrender to what is and be comfortable in the knowledge that anything I think I rely on might, at any time, suddenly change or disappear. Resilience, I have learned, lies not in seeking to insulate myself from the possibility of change and upheaval, but being able to allow it, move with it, and respond mindfully and creatively to whatever circumstances present themselves in each moment. Cultivating this attitude of trust, acceptance and responsiveness has opened me to some remarkable gifts, hidden in this whole experience as if waiting for me to recognise and take hold of them. Once over the shock and out of the ‘action and response’ mode of the first few weeks after the flood, I felt a sense of deep psychological and emotional clearance. Some of the most vulnerable and fragile parts of me had become exposed, in ways that allowed me to hold them in care and tenderness, nurturing a sense of deep comfort and safety. The sensation came that many attitudes, habits and other self-imposed limitations that had previously been holding me back have been swept away. Those that remain are now in such clear focus that I can’t help but also work on releasing them. Into the space of lightness and freedom left behind, new projects, opportunities, ideas and relationships pour forth, many at astounding pace. My life changed that day, suddenly, irreversibly and against my will. A disaster perhaps, and at the same time one of the greatest opportunities for growth and renewal that has ever come my way.